In archaeology and anthropology, a digging stick, or sometimes yam stick, is a wooden implement used primarily by subsistence-based cultures to dig out underground food such as roots and tubers or burrowing animals and anthills. The stick may also have other uses in hunting or general domestic tasks. They are common to the Indigenous Australians but also other peoples worldwide. The tool normally consists of little more than a sturdy stick which has been shaped or sharpened and perhaps hardened by being placed temporarily in a fire. Fashioned with handles for pulling or pushing, it forms a prehistoric plow, and is also a precursor of most modern agricultural handtools. It is a simple device, and has to be tough and hardy in order not to break. 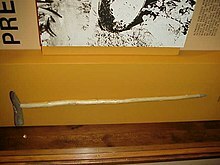 The deungora is a particularly long digging stick is about 110 centimeters, or approximately 3.6 feet, in length with a socket-hafted pointed iron blade as the tip. What's unique about this digging stick is that a bored stone, about 15 centimeters in diameter, is attached at the opposing end. This stone shares the same form as other bored stones that have been discovered in archaeological sites in Africa. Maresha is the Gurage name, also the same word used by the Amhara, for a digging stick that differs in construction because of its forked form. It is used primarily to dig holes for construction, planting, and harvesting roots and tubers. This tool is used as a plow to turn over the soil of an entire field before planting. It is used to break clods of soil in areas where the soil is hard or in areas that may be too steep for plowing, and to dig holes for construction or to transplant domestic plants. When compared to the ankassay, this digging stick can perform the same duties and in addition can be used as a hoe. ^ Study the Digging Stick Mexicolore. ^ a b c Simoons, Frederick J. "The Forked Digging Stick of the Gurage", "Zeitschrift für Ethnologie", Berlin, Retrieved February 27, 2015. ^ a b Nilles, John. "The Kuman people: A study of cultural change in a primitive society in the Central Highlands of New Guinea." Oceania (1953): 1-27.